When Genevieve was but a wee mouse, when she would bump herself and cry, Mom told me to kiss the boo-boo, then say, "All better!" I'm sure this was to make both Genevieve and me feel better, but it didn't seem to work. Then, like with so many things in parenting (and life), all of a sudden, it DID. She bumped her head, I kissed, and BAM! Tears stopped. All better! "Behold!" I announced loudly, "I have arrived as a Real MomTM. My kisses have magical healing powers!" I basked in the glory of my newfound power. All of the groundwork I had laid had come to fruition. I was reaping what I had sown! I am MAMA, hear me give noisy, magic kisses! And then, in a moment of incredible productivity and grace, I banged my forehead on a lamp. Sharply. I hissed (in lieu of saying some Very Bad Words), and put my hand on my forehead. Genevieve looked at me with Great Big Eyes. I knelt down, pointed at the offending spot, and said, "Kiss it and make it better?" Without a moment of hesitation, Genevieve kissed *my* boo-boo. My heart swelled at her empathy, as I announced, "All better!" What you do will come back to you as a parent. It might take a while, but the payoff is totally worth it. So sweet! I have a 7.5 month old, and I'm totally going to start doing this! Awww, if I wasn't reading this in public I'd have testy eyes! They are so sweet aren't they? And didn't her little kiss help your boo-boo feel better? I had the experience, at just that age baby (baby was your friend Flitter!) that when I banged my knee and sat on the floor saying OW very hard (not to say worse words, as you know) and baby came over and solemnly kissed the spot with her tiny baby lips. I was amazed that the pained lessened, immediately. Healing by intention is a real thing, no joke. 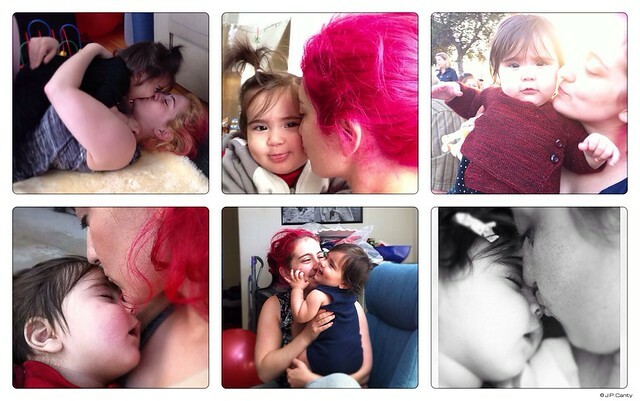 These are the best parts of being a parent (not the banging the forehead part, the magic of her "getting" it).